So, the real question is: Does The Scream still shock? John Canaday, the famous New York Times art critic, said (to paraphrase) of the Mona Lisa; We can't see it anymore. We see the icon, fame and the money it's worth. Paintings can become items of value. They lose the expression of the times, the artist or whatever.... There it is, The Famous Painting. He may have had a point. 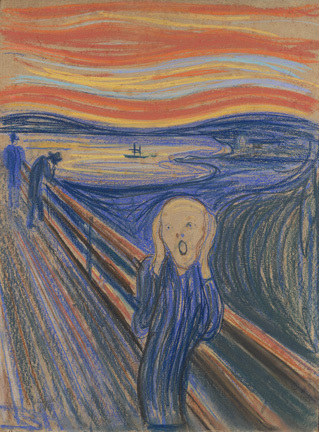 The Scream has turned the corner becoming a historical icon like the Mona Lisa, The Sistine Chapel and Picasso's Les Demoiselles d'Avignon. Some of the other pieces in the show stand out more. Like the Nolde portraits and the wonderful pink street painting by Kirchner. But they all went to school on Munch's achievements. They could not have done their expressionistic paintings if he had not gone first. Probably the first guy to really explore inner horror. As opposed to event caused horror like Goya's war scenes. Munch's work kind of looks creepy and hospital room like. He apparently had a girlfriend who told him she was dying or something. He rowed a boat in the middle of the night to go see her on some God forsaken island. Go ahead look the story up on Google. So anyway she is not sick, laughs loudly and says "Just kidding." He is so streamed that he rows home under a black sky and pretty much swears off dating for the rest of his life. See the show. It's a wonderful gallery and we are all lucky to have it here.